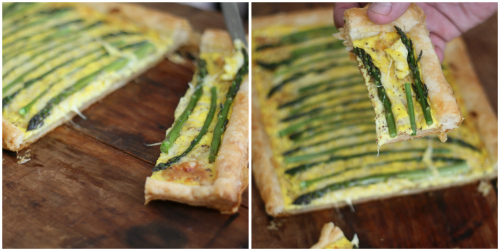 Of course you can buy asparagus just about anytime of the year, but with my affinity for seasonal and local fare, this spring vegetable is the reason I wandered on down to my local farmer's market with plans to make this asparagus Gruyère tart. Here in Richmond, asparagus are at the height of their season, meaning they are going to taste the freshest they will all year round — I couldn't wait. Giving credit where credit is due — I came across this recipe a couple of weeks ago and pinned it after seeing it on Good Life Eats, etc. This particular recipe was written by Shaina of Food for my Family. If you have not checked out either of these great sites, there is some wonderful stuff happening on both besides this amazing tart! 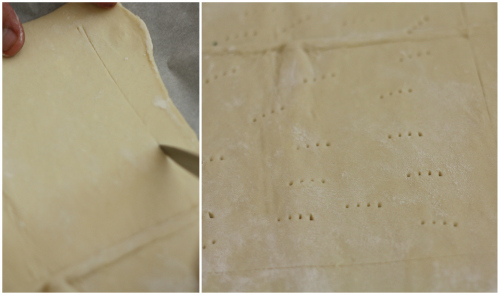 Preheat oven to 400 degrees F. Unfold puff pastry dough and Roll into a 14x10" rectangle on a lightly floured surface. Move the puff pastry to a parchment-lined baking sheet. Score the dough 1" from the edge all around the rectangle with a knife. Dock the inside rectangle by poking it lightly with a fork in approximately 1/2" spaces. Bake for 15 minutes. While the pastry is baking, prepare your asparagus spears by rinsing and removing the woody ends. Set aside. 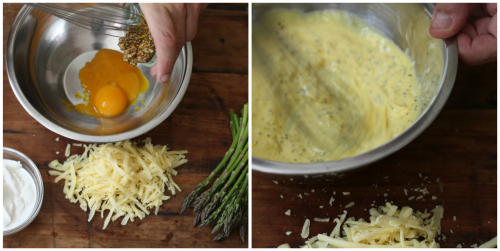 In a small bowl, mix together sour cream, egg yolks and Dijon mustard. Stir in 1/4 cup of the Gruyère. 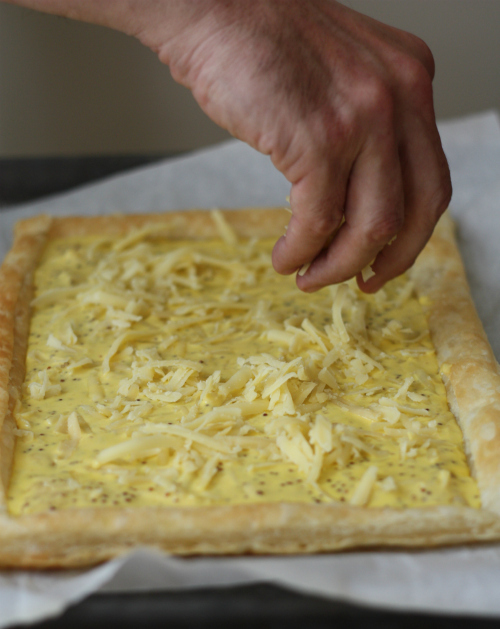 Remove the puff pastry from the oven and spread the sour cream mixture evenly over the inside rectangle. Top with the remaining Gruyère cheese and layer with the asparagus spears. Return to the oven and bake for 15 additional minutes until cheese begins to brown lightly and asparagus is cooked. Remove from oven and allow to cool slightly. Now you're ready to slice it up and serve it warm! 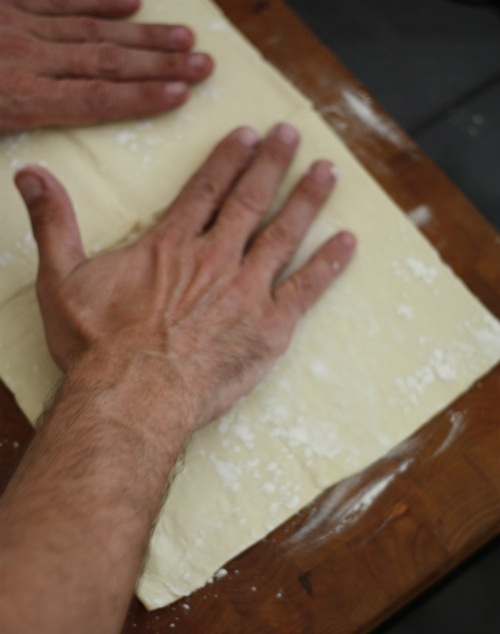 If you have not worked with puff pastry dough it can be a little intimidating. I would suggest reviewing this video from Fine Cooking. Trust me — not difficult at all. So reward your family this weekend by getting out and purchasing some locally grown asparagus, similar to what I picked up from Empress Farms in King William County Virginia. This recipe will certainly impress! Oh that looks really good! Asparagus is something we actually have quite a lot of up here in the produce section so I'm putting that on my recipe list for next weekend. Angie, I can't wait to hear how it goes. It was a huge success here! Oh my this looks heavenly! Impressive....I need to make it as I definitely want to taste this beautiful recipe. Thanks so much for looking. I am sure it will turn out wonderful! 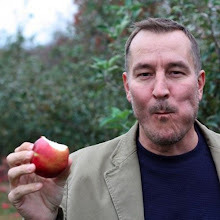 Thanks Tim!! This looks incredible! 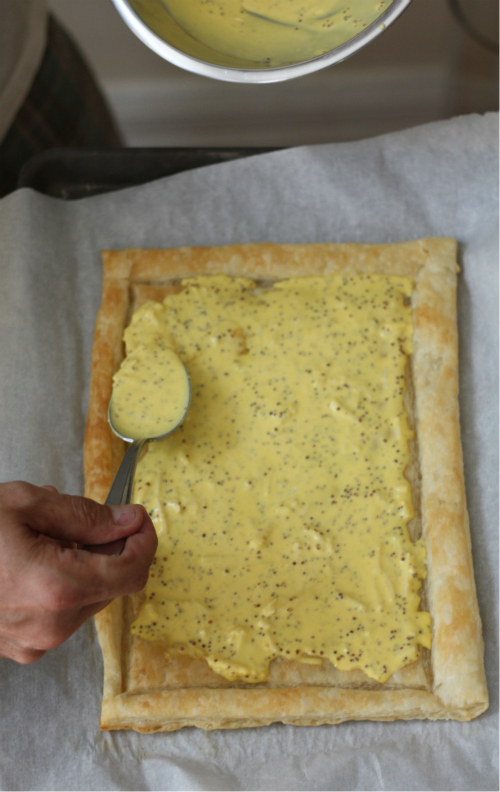 I have some puff pastry in the freezer so I hope this amazing tart will be on my dinner table this week! Looks great as always Tim. Thanks Shannon and glad to see you around again. I am sure you will make this beautiful! Would love to hear how it turns out! 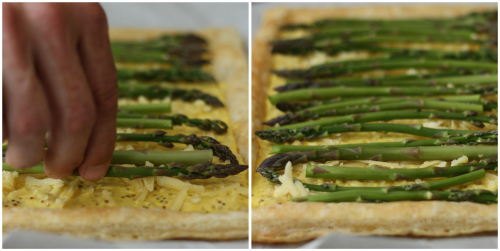 I found your blog through Artful Blogging and had to look up this wonderful asparagus-gruyere tarte. I made it tonight adding shitake mushrooms and garlic sauteed in butter. Magnifique! Merci beaucoup. So happy you enjoyed it Christina and thanks for reading Artful Blogging! Thanks for stopping by!